Cardinal Blase Cupich announces the creation of a new anti-violence initiative in Chicago on April 4. Cardinal Blase Cupich announced he will use $250,000 from his discretionary charitable fund to create a new foundation to fund anti-violence programs throughout Chicago, an initiative with support from Pope Francis. The cardinal told reporters on April 4 that the archdiocese will expand existing mentorship, educational and job programs at Catholic entities and partner with non-Catholic agencies. Speaking in a neighborhood where gang violence is rampant, Cardinal Cupich said the Catholic Church is committed to peace-building. “We are here because the kids are here, because the families are here. They deserve our support,” he said. The cardinal read a letter he received from Pope Francis, who exhorted Chicago’s young people to follow the example of Martin Luther King Jr.
“Walking the path of peace is not always easy, but it is the only authentic response to violence,” the pope wrote. “I pray that the people of your beautiful city never lose hope, that they work together to become builders of peace, showing future generations the true power of love,” he continued. The cardinal’s announcement came on the 49th anniversary of the assassination of Dr. King, and he said the archdiocese will spend the next year encouraging Catholics to reflect on how economic inequality and racism contribute to the city’s violence. Pope Francis has repeatedly mentioned Dr. King in speeches and statements, including in his 2015 address to the U.S. Congress. “The consistent practice of nonviolence has broken barriers, bound wounds, healed nations—and it can heal Chicago,” he continued. For his part, Cardinal Cupich, who said he briefed the pope on violence in Chicago as recently as last month, said efforts to fight the city’s violence will require individuals from all walks of life to work together. To that end, he said parishes in every part of the city will be invited to partake in the effort. “Broad gestures and sweeping rhetoric will not solve the problem. We need to do this person by person,” he said. Among the programs the archdiocese says it is committed to over the coming months, in addition to the “venture philanthropy effort,” are a revitalized youth program, implementing “a robust anti-racism component” to religious education classes, the construction of a new job training center and the launch of a program for youth from around the city to dialogue about ways to combat violence in the city. Various Catholic agencies will expand summer jobs programs and the archdiocese will invest additional resources in its prison ministries. 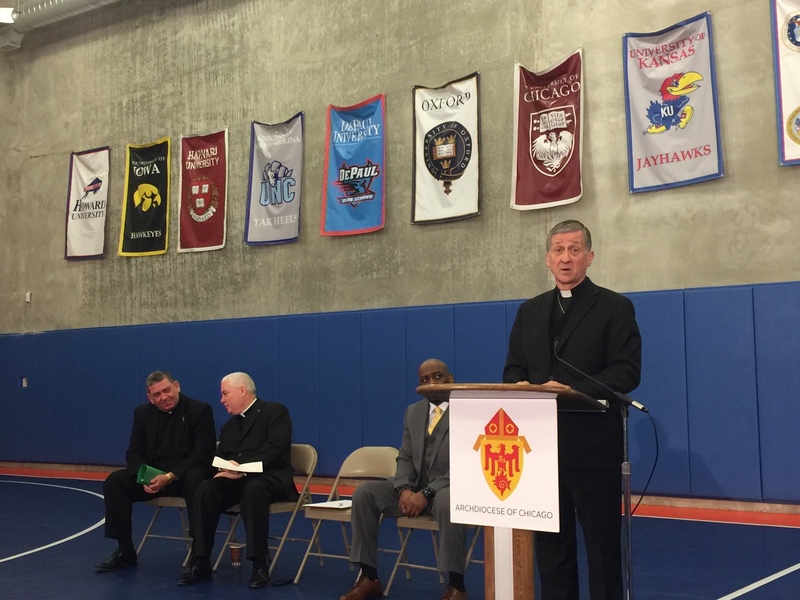 Cardinal Cupich, speaking inside the gymnasium at the Catholic Charities-funded Peace Corner Youth Center, also announced that he will lead an interfaith march for peace on Good Friday through the city’s violence-plagued Englewood neighborhood. “We want to inspire people to work together, giving them hope that we can do something even if we cannot do everything,” the cardinal said. Asked how the archdiocese would be able to provide additional resources as it undertakes a reconfiguration process that could result in the closing of dozens of parishes in coming years, Cardinal Cupich said the church has no choice but to provide assistance where it can. Gun violence in the city is actually down compared to this time last year, the Chicago Police Department reported last month, but the number of shootings is on pace once again to eclipse the combined total number of shootings in New York and Los Angeles, the two largest American cities. With 685 people shot, 124 of them fatally, in the first quarter of 2017, it remains one of the deadliest starts to a year in about two decades, theChicago Tribune reported Mar. 31. Last weekend, four men were wounded and two others were killed in suspected gang violence, just blocks from where the cardinal held his press conference on Tuesday morning. That shooting followed a particularly sensational spate of violence in February, when seven people were killed in a 12-hour span on the city’s South Side, according to theChicago Sun-Times. City officials, including the police superintendent Eddie Johnson, have said theywould welcome assistance from the Trump administration, but say the president has not followed up his outbursts with concrete offers. Mr. Johnsonmet with Attorney General Jeff Sessions in Washington last month to ask for federal money for mentoring, economic development and additional federal agents in the city. In January, Cardinal Cupich compared the city’sgun violence to the Great Chicago Fire, which leveled the city in 1871. After being honored by the council for being given a red hat by Pope Francis last November, Cardinal Cupich asked city officials for "your cooperation [and] support" as the archdiocese considered how it could contribute to efforts to fight gun violence. This story was updated at 4:35 p.m. EDT on April 4. First get the Justice Department, the media, the BLM hoaxters and the bleeding heart liberals off the backs of the police and let them do their duty starting with a dusk to dawn intensive stop and frisk crackdown on every street in the the most violent blocks and districts. Second,start charging parents and/or guardians of teenagers up to age 26(on parent's Obamacare) caught with weapons offenses if one of their charges is caught with one. Third, the clergy,schools and parents need to start preaching behave yourself, police are your friends ,do unto others, and all the old sayings people lived by followed by 'hell and brimstone" if you don't. Fourth stop treating disruptive,vicious students as pouty children and playing nice nice with them, send them to reform schools so the good students can learn. Michael O'Loughlin is America's national correspondent.